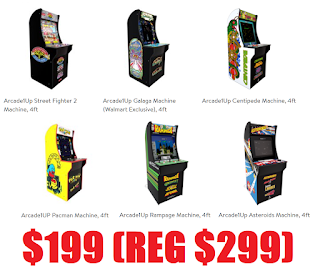 Video Game Arcade Machine Cabinets $199 (Reg $299) + Free Shipping. Choose Your Game From: Pac-Man, Street Fighter, Asteroids, Rampage, Galaga or Centipede. These are 4 ft tall which is shorter than the professional machines that you see in arcades but those machines costs thousands. If you want to make this higher you can buy a stand with it as well to raise it up to full standing heat. Pretty awesome gift!